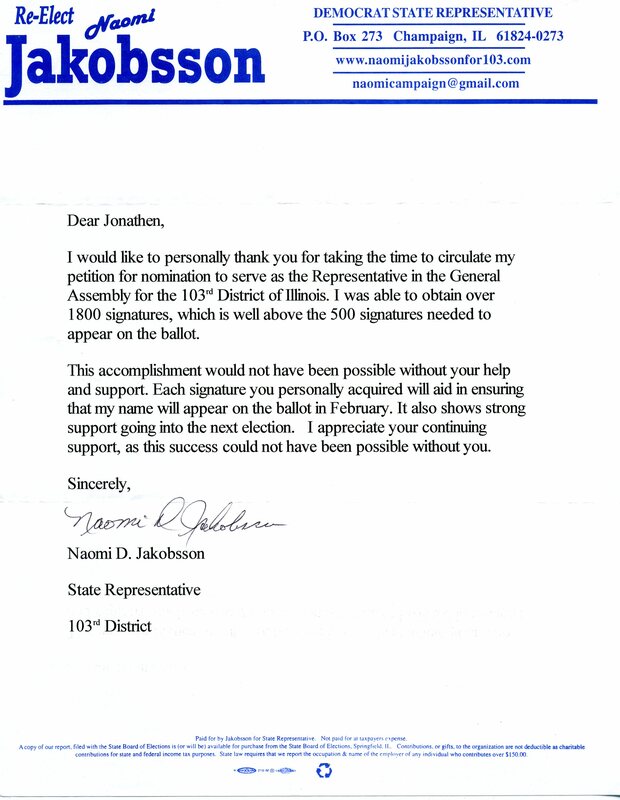 Naomi D. Jakobsson (Democrat) expresses her gratitude towards the contributor for having helped circulating her petition for nomination. 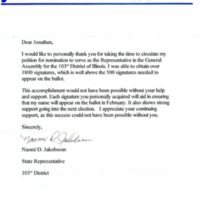 1800 signatures were obtained, which put her on the ballot for the Representative in the General Assembly for the 103rd District of Illinois. Jakobsson went on to win the re-election against the Republican candidate Norman E. Davis (14'302 to 8'534 votes). She represented District 103 in the Illinois House of Representatives from 2003 to 2015 and did not seek re-election in 2014. “Letter to helpers by Naomi D. Jakobsson,” UIS History Harvest, accessed April 19, 2019, http://uishistharv1.uis.edu/items/show/101.